Gentle readers, I have some grave news. Our beloved former Christmas tree, Twiglet Piny Tim McNeedles, has been tree-napped. When I last wrote about Piny Tim, our friends Paul (of Pootling Around fame) and Hannah had agreed to take him in and give him space in their garden. We packed him up and deposited him with many fond farewells at their house, where they parked him (and his friendly plant-pot worm, which we threw in gratis because that’s the kind of people we are) on a patio for the meantime, intending to plant him in the spring. Several weeks later, Hannah and Paul broke the sad news: when they looked outside one morning, Piny Tim was gone. Despite their efforts to determine his whereabouts, no trace of the poor little mite was found. I held off writing this post for as long as I dared. I lived in hope that perhaps at Easter Piny Tim would in the spirit of the season rise again, returning renewed in glory and fresh piny scent. But alas, it seems now that Piny Tim is lost to us forever. I can only hope that the blackguards and rapscallions who perpetrated this heinous crime of tree-thievery have it in their hearts to treat Piny Tim with the gentle, considerate care that he deserves. Somewhere, I hope, Piny Tim is living a relatively happy life, waving his little wonky branches in a gentle sylvan breeze. As for the rest of us Wapping residents, let this be a lesson. Be sure to guard closely those plants which you value, or this arboreal crime wave may yet spread. And now, a moment of silence for poor Piny Tim. You’re in our hearts, little buddy. 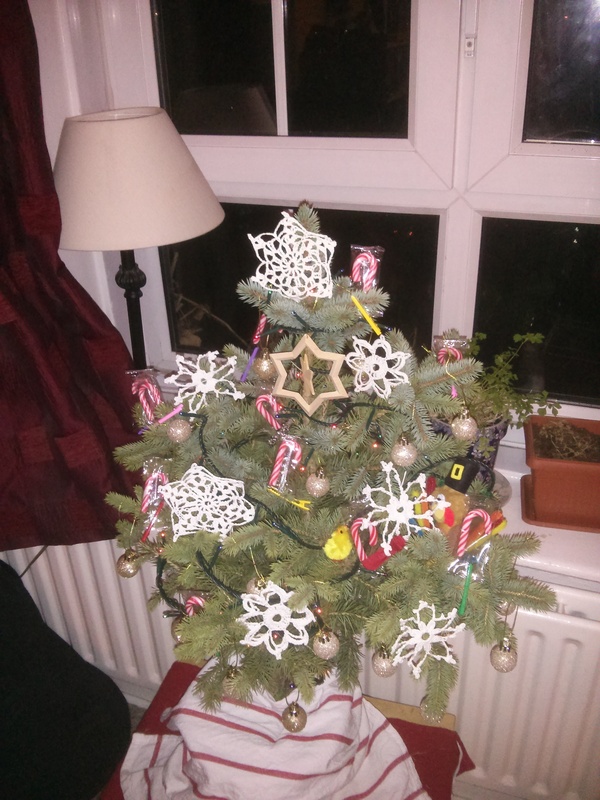 Tags: Christmas, Christmas tree, crime, Easter, friends, London, neighbors, Piny Tim, theft, tree, twiglet, Wapping. Bookmark the permalink.